Speaking of doing-it-yourself, one of the many things a bride-to-be can put together on her own is the ever-popular wedding day emergency kit. 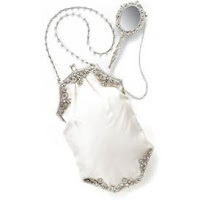 The kit can be carried in your little bridal purse or you can have one of your attendants carry it. The key is to keep it as small as possible. Think "kit" not "knapsack". Many lists around the internet suggest a cell phone for the bride's emergency kit. Oh, how we disagree. We can't think of a single reason for a woman trying to enjoy her own wedding to have a cell phone. Even if the Maid of Honor carries it for her. Even if floral or culinary disaster strike. Someone else should be handling it. We also made the emery board VERY optional since no one can recall a bride needing one during a wedding or reception in the post-dragon-nails era. But what do YOU think? Are we spot on? Or off the mark? Let us know by clicking on comments! I just did a wedding last month and I had a knapsack AND a kit. I think it all depends on your bridal party. This is a great idea! Very practical!